You can use stats.js too! Next question - if you make an platformer game - why your snow stick to layer? Yes, this will be new shader uniform "scroll speed", wich just will be added inside shader to wind. But there is more difficult thing - you must stick snow posteffect to different layers with different params, if you want real depth-imitation. I'll show such demo, but later. It will be real true render, but firstly my friend-designer have to draw layers content. 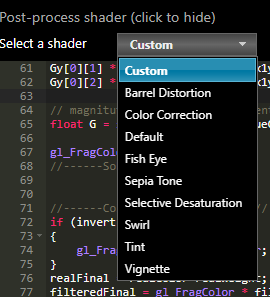 Why not allow to select custom user shader from list? Maybe files with extension *.glsl? It would be very conviniently. Just to be sure I understand, do you mean that we should look for files with a glsl extension in the project, parse them and add them to the list? If that's what you mean, I think it's a great idea. Certainly worth doing.